North Korea Threatens To Resume Nuclear Program - Joe.My.God. North Korea has warned it could revive a state policy aimed at strengthening its nuclear arsenal if the United States does not lift economic sanctions against the country. The statement released by the Foreign Ministry Friday evening came amid a sense of unease between Washington and Seoul over the use of sanctions and pressure to get the North to relinquish its nuclear program. The ministry said North Korea could bring back its “pyongjin” policy of simultaneously advancing its nuclear force and economic development if the United States doesn’t change its stance. The North came short of threatening to abandon the ongoing nuclear negotiations with the United States. 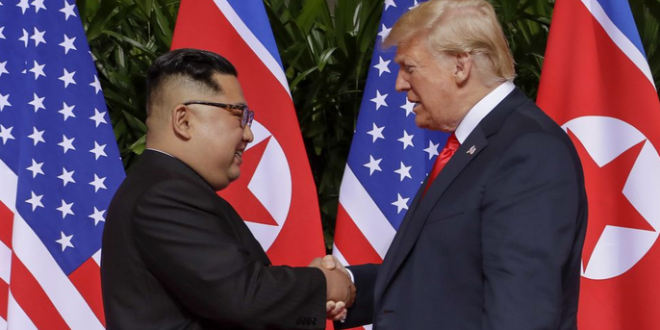 But it accused Washington of derailing commitments made by North Korean leader Kim Jong Un and President Donald Trump at their June summit in Singapore.